Take a walk in the woods and explore right along side Little Red Riding Hood. Tasha Noel's charming illustrations are perfect for a whimsical project and fit for a sweet nursery. 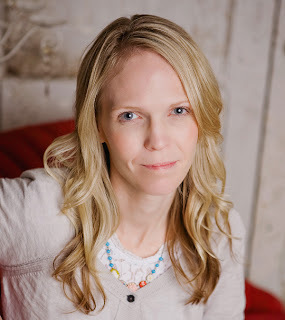 Tasha is here on the Jolly Jabber to chat about Little Red Riding Hood, so let your imagination take you on an adventure! Q: Where did you find your original inspiration for Little Red Riding Hood? A: Little Red has a little history to her, so I hope you don’t mind me sharing how she came about. 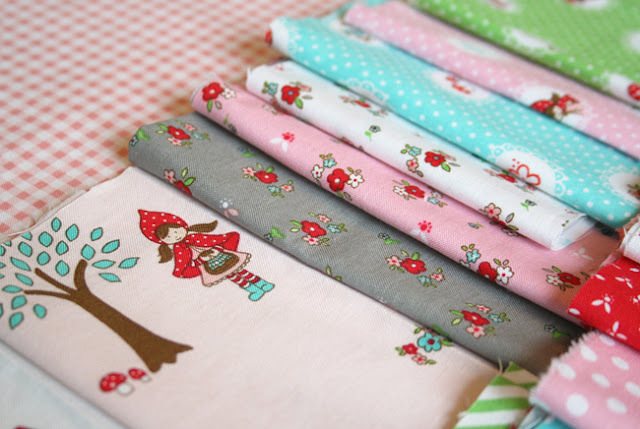 About three and a half years ago I started my shop, A Little Sweetness, joined Flickr and got involved in the sewing and quilting community there. It was a time of inspiration, learning and making new friends. 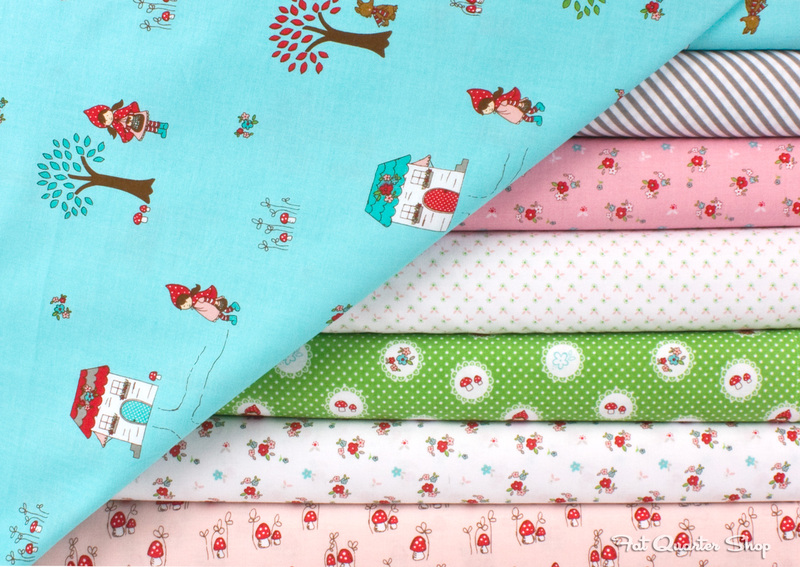 I was noticing a little trend with nursery rhyme and fairy tale fabrics, which of course I also loved. Also at that same time, I learned about Spoonflower. 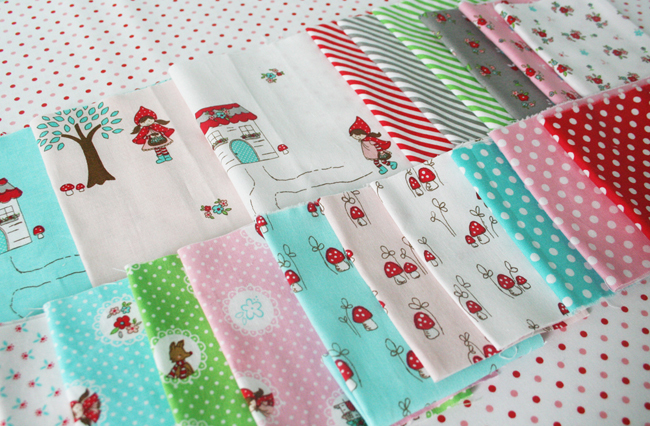 I decided to see what my own version of Little Red Riding Hood would look like on fabric, just for fun. I sold my first fat quarters of Little Red Riding Hood in in November 2009 and it really never ended! When I started designing for Riley Blake, it was agreed that Little Red could become a line if that’s what I wanted to do. It was exciting to do something new for my first line, but this time, it was Little Red’s turn! I made some simple changes to the original design, but it still has the same look and feel. It was so fun to design the coordinates for this line and I really love how it all came together. Q: Tell us all about your sewing machine! What kinds have you had? A: A couple years after I got married and was ready to have my first baby, I wanted to make a baby blanket. I got a very basic Singer at the local fabric shop. It lasted me a quite a long time and I made lots of blankets, my first pieced quilts, curtains and pillows with it. I sewed and sold baby quilts and blankets with my Singer for that too and it did great, but eventually I needed a new one. Money was tight so I got another very basic machine, a Brother. I used that for a few years to make lots of quilts and blankets and clothing for my little girl and it did just fine. Unfortunately its life was short, but I think that was my fault, you probably don’t need those details. ;) Finally (almost 16 years after having my first baby) and luckily for me, the timing was right for a nice quilting machine and I was able to get a Pfaff Expression, Anniversary Edition several months ago. So far I’ve loved it, but I’m also still in the learning phase of having a machine like this verses my others. I love how large the space is for quilting and it feels nice and smooth. A: I just love seeing all the creativity! I’m always in awe of the ideas designers, quilters, sewists, book writers and pattern makers come up with! It’s also great making friends with those that have the same interests. Of course I love starring at fabrics and having conversations about fabric, taking pictures of fabric and sewing with fabric. The inspiration is never ending and I love it! A: Most of my thoughts and ideas stem from either my childhood memories or the here-and-now. I like applying the two together. Basically old and new, past and present. I have always loved children and was drawing little girls and families constantly as a child. Most of my jobs growing up were geared towards children and I had considered a career focused on children. It’s just a natural part of me to be inspired by children. A: Well I do love the main print, especially with the newly added Grandmother’s cottage in there (in aqua, pink and white). But I really love the floral in gray and my diagonal stripes (in red, green and gray). I’m dreaming especially of that green stripe! I can’t wait to put that one to use! A: I’ve always leaned towards blues, greens, reds and pinks, whether it be in decorating, clothing choices, sewing or fabric design. I definitely like happy colors. A hard color for me is purple. Although I’ve worn it a couple of times, I can’t recall ever purchasing anything else purple. That being said, I really love the purples in Denyse Schmidt’s Shelburne Falls. So I never say never. 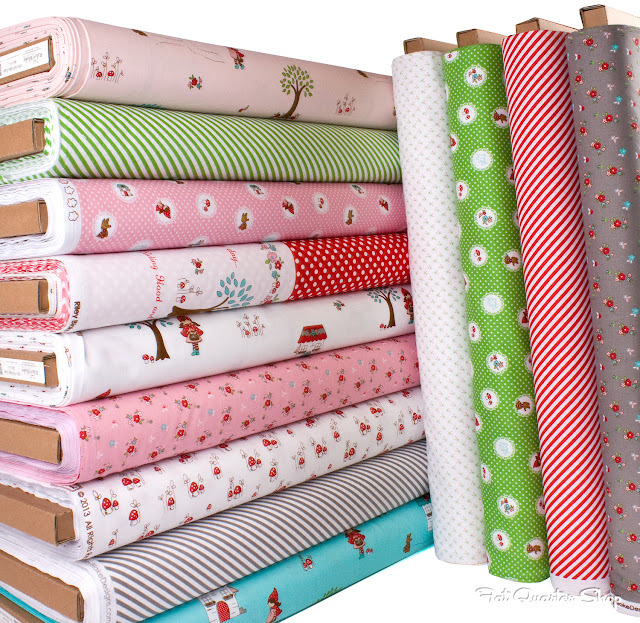 I’ve had it on my fabric wish list, along with way too many others!